The Bulls passionate center is not going to dunk backward on the fast break or throw one off the backboard to himself or throw a behind the back full court pass or step aside and let someone show off a bit. The guy doesn’t even get plays on his own team. They’re not drawing anything up for him in New Orleans Sunday in the NBA’s 63rd All-Star Game. It’s not that Noah is opposed to entertaining on the basketball court or understands the purpose of the event and the weekend. But doing his thing generally is at variance with an All-Star game approach. Because Noah’s thing, especially, is fierce competition and winning the game. “There’s nothing like winning a basketball game,” he’ll often say. Noah’s arc also involves loyalty to those who have been with him as opposed to those whom he might move on with. It’s why you don’t see Noah at the big All-Star celebrity parties in New Orleans but with the fans and his buddies from back home on Bourbon Street. Heck, few people fit in the Bourbon Street scene more seamlessly than the pony tailed Noah, whose dress generally involves some sort of sweater or sweat shirt and what appears to be a pajama bottom. Chillin’, I think it goes. So an All-Star game is difficult for Noah because these guys he’s worked so hard to beat, against whom he’s worked up this rivalry and adversarial nature suddenly are teammates. To be embraced? No, not really. Because there Noah is sitting listening to Indiana coach Frank Vogel explain a few basic plays. LeBron James, whom Noah chided to “grow up” a few years back in Cleveland when James was dancing around in one game, is there. So is Dwyane Wade, renowned for rugged push back in games with the Bulls. “Hollywood as hell,” Noah once described the Heat players. When many feared to complain about Kevin Garnett’s questionable tactics against smaller guards, Noah said during the playoffs Garnett was dirty and later added he was just plain mean. Noah joined Garnett on last year’s All-Star team, and it went fine. It helped that Luol Deng was there and the two Bulls stayed together. Though Noah said he actually was able to enjoy being around Garnett, though less for the personal interaction than the respect for Garnett’s accomplishments. “A favorite was to share moments with the OGs,” Noah said. But it’s also what makes this kind of game so difficult for Noah. He appreciates what those before him have done. But more so for how they accomplished it through supreme competitive effort. Wilt and Russell weren’t friends. Magic and Bird weren’t until much later. Not West and Russell or Oscar and Russell and certainly not Michael and Isiah. They went through these games as well. Everyone does. But perhaps it’s more difficult for Noah because the natural talent was never there to that extraordinary level. He just had to work so, so hard to begin to get into the team picture, and that work is in the relentless nature of game competition. 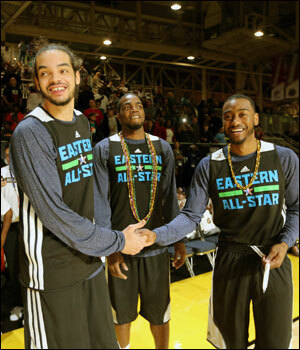 So who, Noah was asked, did he bond with among the East All-Stars? “Nobody in particular,” he said with a smile. “Hello, just hello,” he explained. He wasn’t sad and he wasn’t upset and he wasn’t unfriendly, either. He chatted with Carmelo Anthony during the practice and had some words with Roy Hibbert and Paul Millsap. He didn’t seem to have much to say to James and Wade and Joe Johnson. Noah’s a trash talker. He’s proud of that. When a reporter asked him players he’d want on his three-on-three team he mentioned former college teammate Al Horford and Larry Bird. Why Bird? For the trash talking, Noah said. Noah was particularly having some fun with the Nets in that last game before the All-Star break. You could see Johnson didn’t like it, and he eventually would poke Jimmy Butler with an elbow, drawing a flagrant foul. Noah was enjoying it as Paul Pierce ordered him away. Noah’s been likened to Dennis Rodman at times, though with an actual personality. Mostly for his rebounding and relentless effort. He’s also the kind of guy you love to have on your team and who you come to dislike when you play against him. 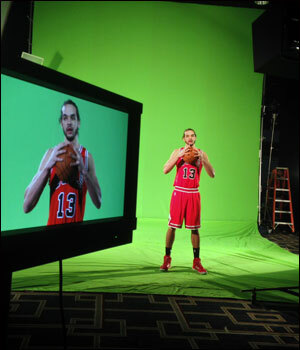 Noah regularly gets booed in introductions more than any other Bull everywhere but in Utah. Not that Noah is unfriendly or unsportsmanlike. He’ll often congratulate opponents after a loss. But not everyone. Not those guys he’s built up to play against for the big prizes. Many of whom were sitting with him in that All-Star locker room Saturday. The cliché is “old school” for a guy who is as new age as they come. It’s also not surprising the highlight of Noah’s weekend is to be with his buddies from New York. They were the guys with him when they were getting thrown out of parties and high schools. They’ve always been there, and what means the most to Noah is not to mingle with the more famous but to express thanks to the least famous by being able to invite them to a special event. You get the sense with Noah that as big a thrill of accomplishment of making the All-Star team is, being able to share it with the guys who embraced him when they were sure he’d never be famous matches that. You see that connection with his teammates as well. It’s why the term “brother” is used by Noah so often and why he was so stricken by the injury to Rose and trade of Deng. Not that others didn’t feel as devastated and disappointed. But Noah puts his soul into people and events, into his team. Though it’s not something he articulates, how can he then become a teammate of guys he’s committed to defeating? Sure it’s an exhibition and for fun and for the fans. He understands that. But you just don’t change for the moment. It’s like leaving your friends because you found more popular and better ones. You just don’t do that. So an All-Star game becomes and exercise in ambivalence for Noah. He’s proud to be here Sunday for the game and to represent the Bulls and Chicago and for what he’s been able to accomplish over the doubts and objections of so many. He loves to bathe in the warmth of that embrace. Yet, at the same time it’s the competition that draws him and what’s enabled him to emerge from the shadows of doubt and insecurity. Especially, competing against the best to bring out the best in he and his teammates. How do you shut that down? You just can’t if you are Joakim Noah. The Western All-Stars have the size with Blake Griffin, Kevin Love, Dwight Howard, LaMarcus Aldridge and Anthony Davis. So Noah may have more of a role than usual with an Eastern All-Star team dominated by perimeter player starters James, Wade, Anthony, Kyrie Irving and Paul George. There’s a $50,000 pay for the winners with $35,000 for the losers. And, like Noah says, “once you get out there the adrenalin kicks in. “I wasn’t tentative,” Noah said about his eight points and 10 rebounds in 16 minutes in last year’s West 143-138 win. “I was just out there having a good time. Got to play with Lu. It was fun to be out on the court with Lu. I’m just taking it all in, enjoying the moment, but (will) have a good time at the game.